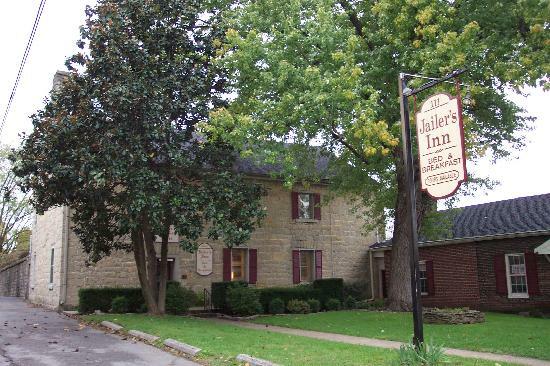 Is Jailers Inn in Bardstown, Kentucky haunted? The property which is now the Jailers Inn, housed prisoners from 1797 till 1987. The front building, sometimes referred to as the "Old Jail" was constructed in 1819. Records indicated that John Rogers architect of St. Joseph Cathedral, performed certain carpentry on this structure. The upper floor of this native limestone building, with 30 inch thick walls, contained two cells and an "upstairs dungeon" to house prisoners. The back stone building, sometimes referred to as the "New Jail," was built in 1874 and is completely surrounded by a stone wall. The front jail was then; made into the jailer’s residence. Both the jail and jailer’s residence were used and occupied until 1987. It was the oldest operating jail complex in the state of Kentucky and is listed on the National Registry of Historic Places. Being a jail, many happenings of extreme sadness and pain were experienced here, as well as a number of deaths. Reports of paranormal activity mostly come from employees and include feeling the presence of people close by when no one is around and the feeling of being watched. Ghostly foot steps in the corridors are also quite a popular experience. there have also been a small number of claims of poltergeist activity, such as doors slamming when no one is there, doors which couldn't possibly be blown shut due to their large, heavy prison style construction.